As always, we encourage any feedback about the articles or suggestions you may have for future content. The public’s patronage of online services such as AirBNB and Stays has prompted local governments to review their current planning schemes. Local governments are coming under increasing pressure from certain residents, landowners, body corporates, holders of management rights in residential community titles schemes, commercial accommodation operators, and so on, to further clarify the regulation of the renting of residential premises through services like AirBNB. At the same time, landowners are identifying with the opportunities that AirBNB can offer. Local governments realise there is an opportunity to collect additional fees and charges from those operators of premises listed on AirBNB and similar sites. This is a first in a series of brief articles that Martoo Consulting will publish examining the current AirBNB debate from a town planning perspective. The process for local governments to amend policies and strategies for new development in their planning schemes is often time consuming. A local government’s need for reviewing certain aspects of its planning scheme differ in urgency, importance and complexity from political, technical and legal perspectives. Some of these above interested parties are seeking local government’s response as a priority to review AirBNB related amendments. Several Queensland local governments have introduced temporary planning instruments which can be introduced promptly in an effort to increase controls over host management sites. This is an interim measure until local governments are able to formally amend their planning schemes. It would appear that some local governments are now more closely reviewing proposals by landowners seeking to extend their dwellings. This apparently cautious approach may have, in part resulted from selected landholder’s proposals that would appear to be intentionally proposed for AirBnB-type usage. It is acknowledged that Council would question a proposed ten bedroom dwelling where all bedrooms are double size and have an ensuite. However, there have been some unusual reactions from local governments when a landowner genuinely proposes to extend the dwelling to include an additional bedroom or rumpus/hobby room for the landowners with no current intent to use the additions for AirBNB. Even if the proposed additions do not include an additional kitchen or laundry, there are local governments who can take the ‘guilty until proven innocent’ approach and levy charges of many thousands of dollars upon approval. Such a charge may be lawful if the proposed addition was a secondary dwelling but not necessarily be considered lawful for a genuine addition to a dwelling house. Hence, applicants are often questioning and seeking clarification from planners in regards to their property usage. As development planners, Martoo Consulting have extensive expertise in all forms of residential development and welcome the opportunity to share their experience regardless of whether it is an extension to a dwelling, a group units in a community titles scheme or a major tourist resort. DEVELOPMENT APPLICATIONS: NEGOTIATION OFTEN BETTER THAN AN APPEAL TO THE COURTS…BUT BEWARE! The current State planning legislation, The Planning Act 2016 commenced on the 7th July 2017. It replaced The Sustainable Planning Act 2009, introducing changes to previous processes and considerations with respect to development applications and their assessment and added certain new processes and considerations. One such example relates to those processes and considerations when undertaking formal negotiations with an assessment manager, such as a local government, immediately after it issues a development approval. Martoo Consulting has always maintained that the ability to negotiate a development approval with the assessment manager should not be undervalued. Normally it is better to enter into formal negotiations directly with the assessment manager with the intent to obtain an acceptable a Negotiated Decision Notice rather than having to accept unreasonable or irrelevant conditions, or conditions that lack certainty, clarity, or accuracy. In most instances, applicants prefer to enter into formal negotiations directly with the assessment manager rather than through appealing to the courts. Under the new Planning Act 2016 it is still possible to enter into negotiations with the assessment manager as existed under the now repealed Sustainable Planning Act 2009. The process involves the applicant making representations (now called “change representations”) to the assessment manager about a development approval during that period after the Decision Notice is issued and within which it is possible for the applicant to appeal to the court (i.e. “appeal period”). Applicants also retain the ability to suspend their appeal period to have further time to make representations to the assessment manager. If an applicant suspends the appeal period to make representations and the assessment manager does not respond within 20 business days (or a longer period agreed with the applicant), the suspension will be lifted and the appeal period as provided for under The Planning Act 2016 will resume. This is a new feature of The Planning Act 2016 and has been referred to as a ‘de facto’ time limit on the consideration of representations by the relevant assessment manager. But beware. It should be appreciated that there is no positive obligation on the assessment manager to respond to representations within this timeframe under The Planning Act 2016. Importantly, this change under The Planning Act 2016 also means that applicants can be caught out if they are not aware that their appeal period will automatically resume if they do not receive a response from the assessment manager within the 20 business days of the submission of their change representations. Under The Planning Act 2016, change representations will be assessed by the assessment manager against the same matters that must be considered when deciding the relevant development application. If the assessment manager agrees with all or part of the change representations, a Negotiated Decision Notice is issued by the assessment manager so as to amend the original decision notice to include all agreed changes. Therefore it is important to obtain advice from an experienced professional to compile and lodge changes representations as soon as a development approval is issued. All professional planning staff at Martoo Consulting have between 10 and 30 years’ experience as private consultants dealing with development applications. Following careful consideration, Martoo Consulting Pty Ltd has decided to withdraw its direct involvement in land surveying to focus on the core business of town planning, urban development and development management. Land surveying services for the Sunshine Coast continue to be available through Noosa Cooloola Land Surveys. Contact Mike Campbell on 0412 603 286 (mike.nclsgroup@gmail.com) or David Lau on 0419 782 360 (dlau@bigpond.net.au). The Koala Conservation Management Plan and The Gympie Region Environment Strategy were both endorsed at Wednesday’s (23 May) Council meeting. Cross River Rail Project – What About the North Coast Line? Airbnb has turned sharing our homes and living spaces with strangers from a fringe idea into an income. Much has been written in the media about this disruptive land use change, with most knowing somebody who is making a bit on the side by renting their house out during holiday time to fund their own holiday. Over the last 5 years Council’s have taken a hands off approach to this disruptive land use change, however is this all about to change? The Noosa Plan currently requires an impact assessable planning application for a bed and breakfast use, while the Sunshine Coast Council Planning Schemes is more self-regulating allowing for up to 6 people stay for no more than 14 days, so long as the resident owner manages the stay and is reserved a room. However, with more than 1,000 listings on the Coast for short stay accommodation, there have been only 6 applications approved for a ‘bed and breakfast’ use in the last 5 years by both Councils. Rather, Council has taken a ‘hands off’ approach only responding to complaints from neighbours when the temporary AirBnB residents get out of hand (i.e. party houses). In which case, the owner stops advertising, or buys a house nearby with more understanding neighbours. Local Councils are having to respond to the other neighbours having to put up with the amenity impacts (noise, car parking, rubbish etc.). Academics and strategic planners have been complaining about the societal concerns associated with the impacts on the local rental market and social cohesion in these transient tourist areas. And now the tourism lobby are now complaining AirBnB is impacting on hotel chains bottom lines. Concern is raised about the lack of regulation of people running hotels out of residential buildings, and highlighting how Airbnb hosts do not collect hotel taxes, tourism levies and are not subject to the same health and fire safety regulations that hotel operators must follow. In response, Noosa Council recently announced they are looking at ways to formalise AirBnB’s by creating a management policy (and a way of taxing) for the use within the new planning scheme. They have also asked LGAQ to lobby the State government to develop a policy response. Considering other State Laws recently brought in to control ‘disruptive’ changes such as Uber (as a result of the Taxi Industry lobbying), which include the requirement for licences and annual fees – could this be the start of regulation for this disruptive land use change? Shaping SEQs is the third ‘big’ regional plan for South East Queensland and sets the parameters for land use planning to grow from 3.5 million to 5.3 million people in the next 25 years.he plan uses all the modern planning terms including responding to ‘global megatrends’, ‘missing middle housing’, ‘sweating our assets’, ‘inter urban breaks’, ‘place making’, ‘disruptive technology’. However, what is much different from the previous plans to this version is the more collaborative approach the State are proposing to ‘work with’ the 12 local governments, which make up the region. What does it mean for the Sunshine Coast? More development towards Brisbane with the expansion of ‘Beerwah East’ as a Ministerial Designated Area. Giving it special status as a large growth area requiring significant state infrastructure investment for its urban development. Halls Creek (south of Stockland’s Aura development) is identified as a potential ‘Future Growth Area’. This means the land has at least been shown on a map for expansion in time the next update of the plan in 5 years. The Sunshine Coast is required to accommodate 53,700 new ‘infill’ unit developments, and 33,300 new ‘greenfield’ developments over the next 25 years. Equivalent to 2,148 new units & 1,332 new detached house lots per year. Opinion – A lot of the new detached house growth and development will be focussed on the southern end of the coast. Although ambitiously targeting more unit developments, the plan is for more quarter acre block on the outskirts of greater Brisbane. What does it mean for Noosa? No expansion of the urban footprint for the next five years. The State want to see more consolidated development with 4,800 new ‘infill’ units, and 1,600 new ‘greenfield’ houses over the next 25 years. Equivalent to 192 new units & 64 new detached houses per year. Opinion – These are fairly low and unambitious targets for growth in Noosa. Even with many sites being zoned for higher densities it is the individual landowner who is deciding whether it is worth building another 10 bedroom house on their unit zoned land near the river/beach. What does it mean for Gympie? Despite having a new 4 lane highway connecting Gympie to Brisbane making travel times less than 2 hours, there are no State urban footprint restrictions. Gympie Council is planning for the overflow of South East Queensland and recently endorsed the Southside Local Development Area Structure Plan to accommodate a further 1,200 dwellings in an emerging uan area. Opinion – Considering the greater connection with Brisbane and the Sunshine Coast, as well as the cheap cost of land in the area it will be interesting to watch Gympie’s growth over the coming years. Regional plans are reviewed generally every five to seven years. Feel free to come in and speak to our qualified and experienced planners, who can provide greater insights into the opportunities and constraints for appropriate land development within the region. All Aboard the Cross River Rail Project! What about the North Coast Rail Line? The South East QLD transport network connects the region from Gympie to the Gold Coast. As a sometimes user of the network, I can attest to the fact that the network is pretty efficient, air conditioned and modern compared with other regions and countries. However in South East Queensland the car is still the dominant form of travel, and while I can get a train from Gympie to Varsity Lakes that takes just under 5 hours, I predominantly choose to drive the 3½ hours, endure the tolls, roadworks and the overcrowded Nudgee service centre toilets. Brian Feeney from the University of Queensland recently commented that the push by the QLD State government for the Cross River Project (reinforced by the Shaping SEQ plan) provides for a second railway connection through the Brisbane CBD, but at the expense of decentralisation. He argues this large infrastructure spending will serve areas that already have comparatively good public transport services, whereas the suburban and coastal areas where most people live would continue to have limited transport options. Give most people a proper rational choice between driving and catching good public transport, and the decision will be between what is cheaper, more efficient and more environmentally sensible. If driving to Brisbane from the coast for and having to be somewhere by a certain time, most still choose driving. The big growth for the coast in the Shaping SEQ plan document is to open up the southern end of the coast with new Stockland houses. Isn’t it time the State also pushed for a large infrastructure announcement for the North Coast Rail Line? Spring is bushfire season in our region. 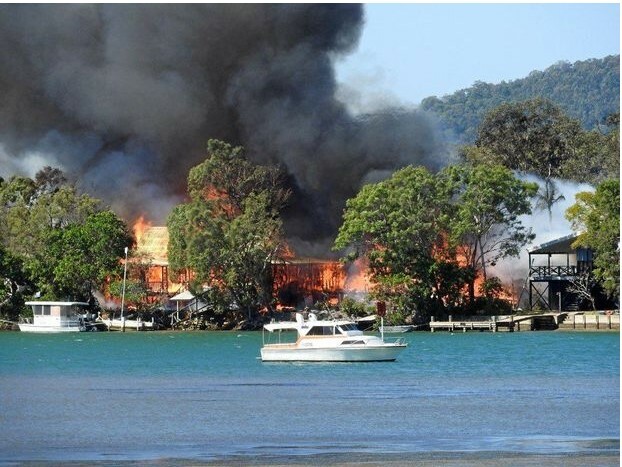 We have already had some intense bushfire’s early in the season with houses being lost on the Noosa North Shore and evacuations at the southern end of the coast. Bushfire hazard planning is of critical importance to any new development. Noosa Council recently refused an aged care facility on part of the Noosa Civic site, with the bushfire hazard risk likely to unduly burden disaster management response and recovery capacity and capabilities. New developments on the south end of the coast also forced residents to flee from their new estate houses. Come and speak to our experienced and qualified planners who can assist in providing you the upfront information to avoid a costly Council refusal, or appropriate design responses to help manage bushfire risk. The new Planning Act commenced in July and introduces new terminology, processes and procedures. Most local governments have also amended their plans to align with the new Planning Act. However, there is no need for local governments to advertise or identify the amendments made to the plan. Further restrictions on the subdivision of rural land for primary production (which is undefined). Anyone who was considering to proceed with a development application under the previous Sustainable Planning Act is advised to check with a consulting planner to clarify the changes which may have resulted with the introduction of the new Planning Act. The Sunshine Coast Council just can’t catch a ‘break’. With the Halls Creek expansion included within the Shaping SEQ Plan, despite Mayor Jamieson being vehemently opposed to Halls Creek being a potential Growth Area. Considering the break is currently approximately 20km wide, at least it’s not as narrow as the 2km between Ormeau and North Coomera on the Gold Coast. Gympie is still on track to utilise more ‘Sun’ than the ‘Sunshine’ Coast, as a massive $2 Billion dollar solar farm on the outskirts of Gympie is in the approval process. If completed, the solar farm will power over 315,000 homes. All the good weather has resulted in Section C of the Bruce Highway upgrade nearing completion, with the real possibility of the highway being opened before Christmas. Note: If you’re having trouble downloading the links – Right Click the link and ‘Open in Incognito Button’ (Google Chrome) or Right Click the link and ‘Open in New Window” (Internet Explorer). While the media focuses in on the negatives of the dreaded ‘housing bubble’ in terms of high house prices and home ownership becoming more out of reach for younger generations in capital cities, perhaps this ‘bubble’ can bring opportunities for the Sunshine and Cooloola Coasts? 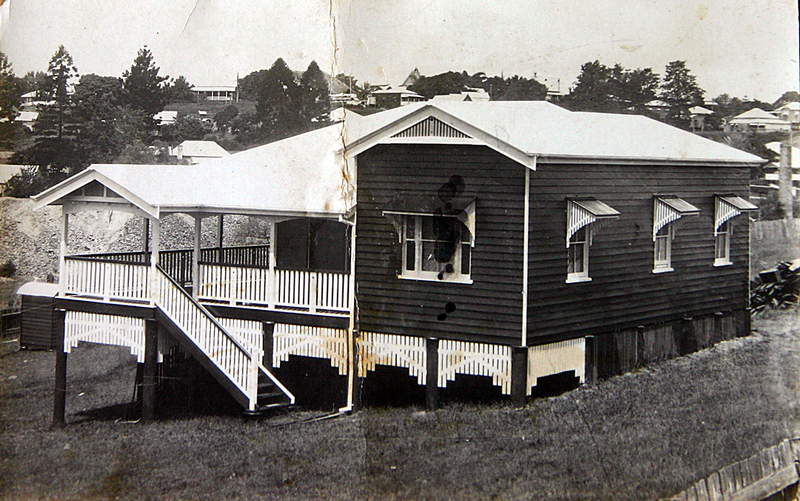 The 1980s and 1990s was a time of significant growth here on the Sunshine Coast, with internal migration from Sydney and Melbourne at its peak. This was largely a reflection of the cheaper housing market (not having to pay such a high interest rate) and the ‘ideal’ of a better lifestyle. Are there parallels to today’s internal migration patterns? Id. released an article last week about the release of the ABS Internal Migration Estimates titled What’s driving Sydney’s population exodus, which suggests a strong correlation between Sydney’s housing bubble and the current internal migration patterns. While not as pronounced as the ‘sea change’ migration of thirty years ago – many are leaving the city again. As previous migrants moved to the Coast for a cheaper and better lifestyle, they changed once small country towns to suit their needs, what will the next generation of ‘sea changers’ bring with them? And how will they further change the landscape of the different communities of the Sunshine and Cooloola Coasts? Even with new suburbs being created and old towns changing, let’s not forget why this place is still so desirable – our beautiful environment and National Parks – where one can cheaply enjoy the ‘bubbles’. I personally love the ‘bubbles’ of the Noosa National Park point breaks – even makes me jump in when the temperatures start to drop. 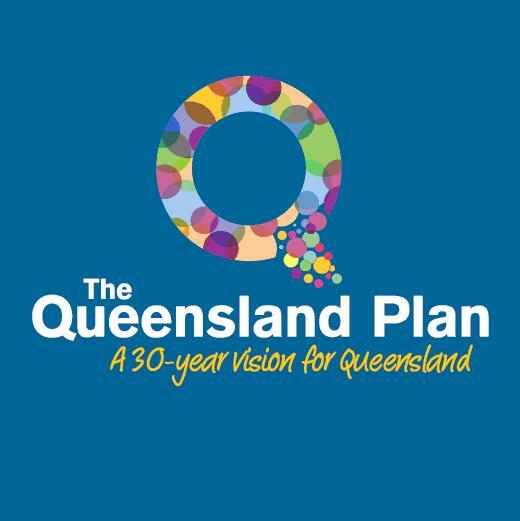 The new Planning Act 2016 (commencing mid-2017) establishes the overarching framework for Queensland’s planning system and provides the foundation for various elements of this system, including compiling new planning schemes, development assessment and dispute resolution. The new state legislation also establishes the rights, roles and responsibilities necessary for the system to work effectively. The new development assessment process retains a performance based approach and is underpinned by a set of guiding principles. These principles are intended to guide the way that all parties to a development application approach the development assessment process, and set the tone for expected behaviours throughout the process. Applicant-driven process – Reinforce the role that the applicant plays in streamlining the development assessment process. Process efficiencies – Emphasis on undertaking pre-application discussions with the assessment manager and with each referral agency to create process efficiencies. Holistic assessment – Enable a holistic assessment to be undertaken of the development application. Open communications – Encourage and facilitate open communications between the assessment manager, referral agencies and the applicant. Public notification – Facilitate effective public notification in the development assessment process for development applications that require public notification. User friendly – A more user friendly, navigable and transparent system that facilitates quality development outcomes. Martoo Consulting has been actively involved with the Industry briefings and ongoing Council advice before the commencement on the 3 July 2017 (less than a month). ‘Duplex’ or ‘Dual Occupancy’ are terms to describe two dwelling units on a single lot. Martoo Consulting staff has been involved with the design and approval process for numerous duplex developments over the last 2 decades on the Sunshine and Cooloola Coasts. The following provides a summary of Council’s approval process and common issues. Parking and Maneuvering to leave site in forward gear. All development works need to be signed off by a registered engineer. Duplexes are supported in both the urban residential zones, being the Residential Living Zone and Residential Choice Zone. A planning application (material change of use) is also required for dual occupancies in both zones. The minimum preferred lot size for this development is 500m2 in the Residential Choice Zone and 750m2 in the Residential Living Zone within Gympie’s urban area. Gympie Regional Council support dual occupancy proposals when compliant with the design preferences in the relevant zone code in relation to maximum building height, the provision of private open space, boundary set-backs etc. Would you like an Outdoor Area with your unit? When commencing any multi-unit development, an important aspect which is often an afterthought in the titling process is the legislative requirements for the boundaries of lots and common property. This is an important issue which should be discussed at the start of the development process, and can assist to reduce delays in the issue of tile deeds. The right titling could potentially add significant value to the unit price, and minimise the potential for related body corporate disputes later on. The most common form of unit titling is a Building Format Plan (previously known as a Building Unit Plan (BUP)) and defines the unit areas by the structural elements of a building (e.g. the centre of walls). This titling applies to multi-storey unit complexes and is often referred to as strata titling. 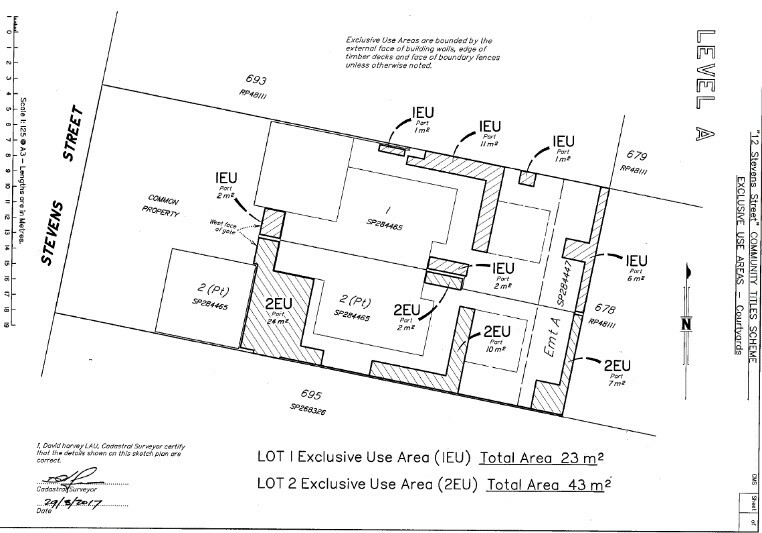 An example of a Building Format Plan defining the building and the Exclusive Use Areas. The lot owner is generally responsible for the inside of the walls, and the body corporate is responsible for maintaining the outside of the building, foundations, roof, and essential structural elements of the building even if they are not on common property, roads, gardens and lawns on common property. Exclusive Use Areas are usually drawn up to demarcate the area the owner has the benefit of, unless the ‘exclusive use’ provisions in the Community Management Statement (i.e. Body Corporate By-Laws) state otherwise. This form of community titling does not require a subdivision approval. However, the local government does not need to issue a certificate for the survey plan and the Community Management Statement to confirm that these comply with state planning legislation. An example of a Standard Format Plan defining the individual lots and the common property along the driveway. A Standard Format Plan in a community titles scheme (previously known as a Group Title Plan (GTP)), defines land using marks on the ground or the outside of the building. This titling can apply to townhouse complexes where each lot owns the building and a ‘yard’. The benefit of this form of titling is there is usually less common property and as a result there is less body corporate maintenance. Each lot owner is responsible for the inside and outside of their building, foundations, utility infrastructure, lawns, gardens and driveways inside their lot. However, because this titling involves the subdivision of land, a subdivision application is required with Council. The subdivision is usually undertaken at the same time as the planning approval (i.e. Material Change of Use) for the building/s as a combined application, as the resultant lot sizes are usually smaller than a lot subdivision that is not in a standard format Community Titles Scheme. Martoo Consulting is pleased to report that The Parkyn Brothers Jetty in Tewantin has been approved for upgrading to provide a contemporary jetty and floating pontoon facility. In place since 1951, the jetty has been used for transport, fishing and houseboat hire. Martoo Consulting has worked closely with Noosa Council and State Government over the last 18 months to secure the extension to the lease and planning approvals for the jetty redevelopment. The redevelopment includes the addition of a new storage building designed to be sympathetic to the existing uses on the Noosa River; relocation of the reception and storage area will improve public safety and security by locating it closer to the jetty entry; and the replacement of the existing jetty with a wider jetty with hand rails to comply with current anti-discrimination (disability access) and building standards. Works are set to commence in the coming weeks ahead of the jetty’s reopening for another busy Spring/Summer in Noosa. Martoo Consulting has a long history and extensive experience in dealing with development proposals in and around each of these precincts. Because of this Martoo Consulting has been liaising with Gympie Regional Council on Council’s proposal to adopt structure plans over these local development areas since before the current Gympie Regional Council planning scheme (2013) was introduced. More recently Martoo Consulting has made submissions to Gympie Regional Council on behalf of several landowners on the preliminary Draft Structure Plan for the Southside Local Development Area. Gympie Regional Council has recently released the final draft Structure Plan and has invited feedback from landowners and the broader community until 5pm on 23 December 2016. Again Martoo Consulting is working with certain landowners and the general community to help ensure that their interests are better represent in the adopted Structure Plan for the Southside Local Development Area. Martoo Consulting can be contacted if any assistance is required in providing feedback to Gympie Regional Council. The Gympie Regional Council adopted the current 2013 Gympie Regional Planning Scheme on 1 July 2013, and as such, the one year anniversary for the take effect date is fast approaching – in less than a month from now. Developments lodged to the Gympie Regional Council after 1 July 2014 will no longer be able to request assessment under the superseded 2005 Cooloola Scheme. In some instances, this can significant affect the viability, profitability and design outcomes for the development of land. It is suggested that even if you are considering developing land in the next 5-10 years time, that you urgently contact Martoo Consulting to conduct a due diligence exercise. Our planners have the requisite experience to promptly provide advice on whether your approvals for possible future development should be started today – to avoid missing out. Existing landholders, potential purchasers, and developers take note – this is an exercise which simply must be undertaken for anyone considering developing land in Gympie.